A square bath screen is a great alternative to shower curtains. Choose from a variety of screen sizes and finishes to complement your bath and bathroom. 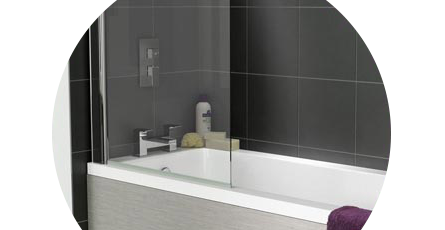 Our square bath shower screens are also available with rails for added functionality and style. Transform the look of your bathroom with a gorgeous bath screen. Choose from fixed and hinged designs to make sure your square bath screen works exactly the way you like. A fixed screen will remain in a set position whilst a hinged fitting will allow the screen to swing open making it easier to get into the bath. All of our square shape bath screens are constructed to high manufacturing standards to ensure not only a beautiful look, but a smooth action and flawless function. Choose from a range of glass height, width and thickness including 5mm, 6mm, 8mm and 10mm.